Home / Thank you for helping to make Starts at Home day 2017 a huge success! By Ella Cheney, who works in the Campaigns team at the National Housing Federation and managed Starts at Home 2017. Now in its second year, Starts at Home day on 1 September saw hundreds of housing associations and people join the campaign to celebrate and advocate for supported housing. The Starts at Home campaign aims to ensure that people who need extra support will always have a safe home that meets their needs. This year we wanted to build on the successes of 2016 and deliver a campaign that housing associations, supporters and politicians would be proud to champion on Starts at Home day. come together on Starts at Home day (1 September 2017) to share campaign activities as part of our day of national action. All of this activity resulted in an exciting day of action that effectively highlighted how vital supported housing is. 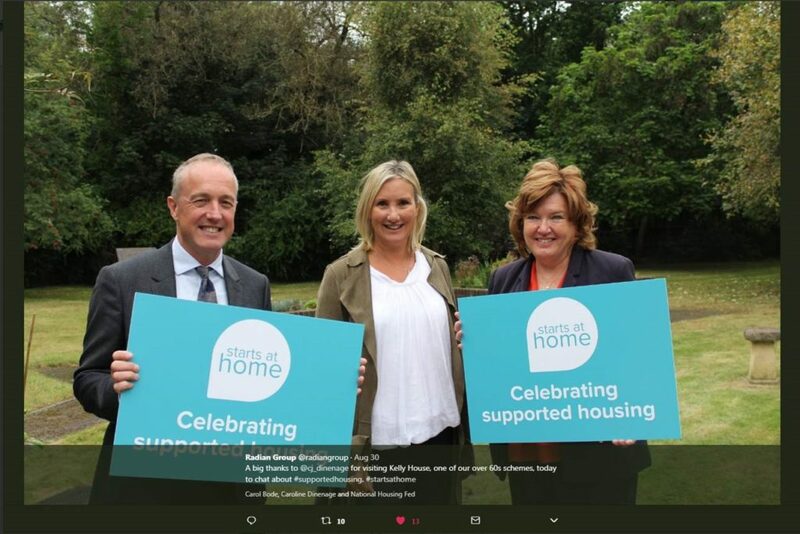 We saw MPs visit supported housing schemes across the country and we received numerous case studies that we then included on the Starts at Home website and shared on National Housing Federation’s new Instagram account. Overall, we recorded an impressive 27 MP visits to supported housing schemes from both major political parties. We were particularly pleased to see Parliamentary Under Secretary of State, Caroline Dinenage visit a Radian scheme in Southampton. On Starts at Home day, about 1,400 of you sent nearly 3,400 tweets using the #startsathome hashtag which generated a potential reach of 2.4m. This was enormously helpful in highlighting the inspiring stories of people who, with the help of supported housing, have managed to turn their lives around. We also recorded nine pieces of press coverage, notably Home Group Chief Executive Mark Henderson’s piece in the Huffington Post. Starts at Home day 2017 successfully highlighted the vital work of supported housing but raising awareness is an ongoing process so there’s plenty more to be done. Share our promotional graphics and poster-maker on social media. Share your positive stories about supported housing using the #startsathome hashtag. Engage with local MPs and invite them to visit supported housing schemes. Let them know why supported housing is so important. Send us resident case studies to help us tell the story of supported housing’s vital role. Request a Starts at Home supporter board for any campaigning events. Looking ahead, the National Housing Federation will work with housing associations to keep MPs engaged with the Starts at Home campaign. Find out the latest at www.housing.org.uk/supportedhousing.